Need help getting organized? 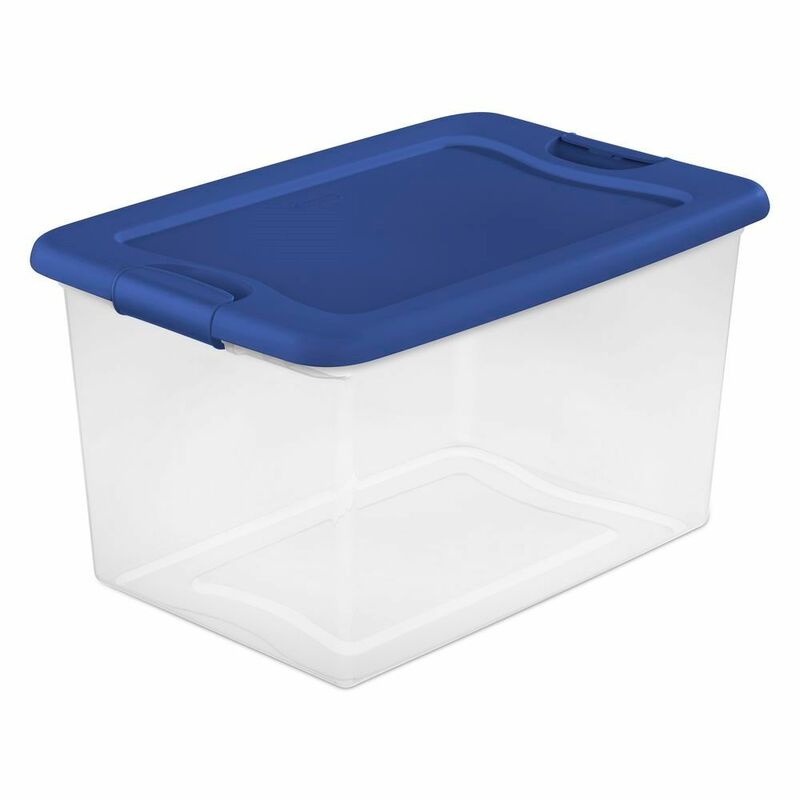 Step up to the Sterilite 60 Liter Latching Box, featuring a modern space saving shape and an innovative hinging lid. Simply undo one latch and lift the lid for easy access, all with one hand. The other latch stays attached and acts as a hinge, even when the lid is opened all of the way. This size Latching Box is ideal for storing off season clothing, sporting equipment, boots, blankets and other bulky items around the home. The recessed lids allow same size storage boxes to stack neatly on top of each other to use vertical storage space efficiently. The 30 L and 60L Latching Boxes use the same lid, allowing both the shallow and deep sizes to be stacked in same footprint. The overall assembled dimensions for this item are 23 3/4" x 16" x 13 1/2". 60L Latching Storage Box Need help getting organized? Step up to the Sterilite 60 Liter Latching Box, featuring a modern space saving shape and an innovative hinging lid. Simply undo one latch and lift the lid for easy access, all with one hand. The other latch stays attached and acts as a hinge, even when the lid is opened all of the way. This size Latching Box is ideal for storing off season clothing, sporting equipment, boots, blankets and other bulky items around the home. The recessed lids allow same size storage boxes to stack neatly on top of each other to use vertical storage space efficiently. The 30 L and 60L Latching Boxes use the same lid, allowing both the shallow and deep sizes to be stacked in same footprint. The overall assembled dimensions for this item are 23 3/4" x 16" x 13 1/2". 60L Latching Storage Box is rated 4.8 out of 5 by 42. Rated 5 out of 5 by Teena from Gold storage. Easy to use and clear to be able... Gold storage. Easy to use and clear to be able to see contents for organization purposes.